" Honda and Toyota left Detroit's Big Three in the dust in the Union of Concerned Scientists' (UCS) biennial ranking of the greenest automakers. For the fourth time in a row, Honda topped the science organization's rankings as the country's greenest automaker. But Toyota lost by only a nose, surging to second place by making significant cuts in global warming pollution. " Honda, the most fuel efficient car company in America1, has earned the title of America's "2007 Greenest Automaker" from the Union of Concerned Scientists (UCS) for the fourth consecutive time. The award is given by the UCS on a biennial basis to the company with the lowest overall production of smog-forming emissions and global warming emissions (primarily CO2) in its U.S. automobile fleet. ”Honda remains the greenest U.S. automaker. The company installs clean technology across its entire fleet of cars and trucks and that consistency makes it a top environmental performer. 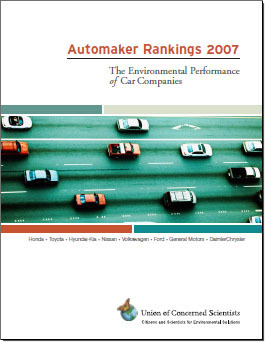 Honda is one of only two automakers to have better-than-average global warming scores in every class of vehicles it sold in MY2005," said Don MacKenzie, a vehicles engineer with the Union of Concerned Scientists. "In addition, Honda continues to have the best smog score in four out of the five classes.” "